Here, the TOTAL=200 option specifies the finite population total from which the simple random sample of 19 cities is drawn. You can specify the same information by using the sampling rate option RATE=0.095 (19/200=.095). Output 114.1.1 summarizes the data information and the fit information. Output 114.1.2 presents the significance tests for the model effects and estimated regression coefficients. The F tests and t tests for the effects in the model are also presented in these tables. Note: The denominator degrees of freedom for the F tests is 18. Note: The degrees of freedom for the t tests is 18. 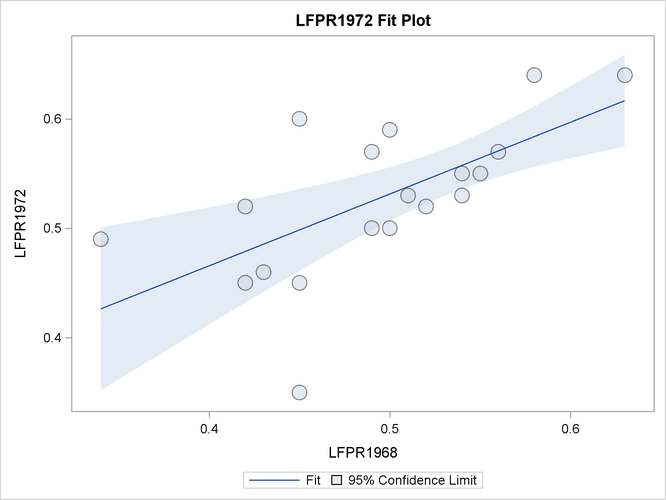 From the regression performed by PROC SURVEYREG, you obtain a positive estimated slope for the linear relationship between the LFPR in 1968 and the LFPR in 1972. The regression coefficients are all significant at the 5% level. The effects Intercept and LFPR1968 are significant in the model at the 5% level. In this example, the F test for the overall model without intercept is the same as the effect LFPR1968. When ODS graphics is enabled and you have only one regressor in the model, PROC SURVEYREG displays a plot of the model fitting, which is shown in Output 114.1.3.